Socks for school are easy to come by, especially grey ones for boys. The trouble is finding ones with a high cotton content. I did look for 100% cotton before MyItchyBoy started school, but realised early on that they didn’t exist in all my online searches (closest I got was in blue or black) so I settled for any socks I could find with 72% or more cotton. During term time, MyItchyBoy’s eczema is worse on his hands and ankles. The eczema improves in both places during school holidays but is back again the first week of each term. Outside of school, he has brightly coloured socks with closer to 90% cotton and shoes with better linings and more breathable style than standard school shoes offer. Finding a sock and shoe combination that means no sore, red, itching ankles at school has been my goal for a while now. 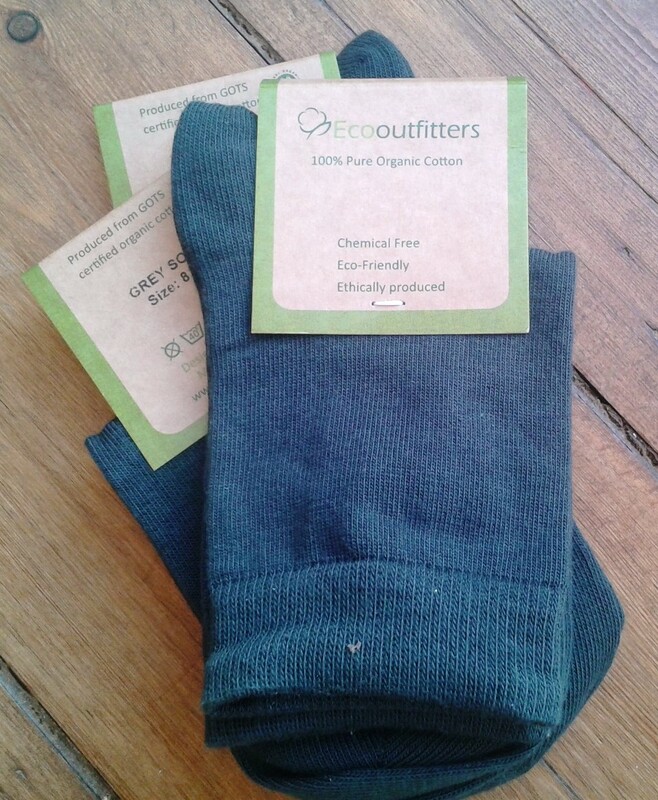 You can imagine then, how super happy I was to receive some 100% organic cotton socks for school to try from www.everythingforeczema.com and Ecooutfitters. We’ve been trying a new eczema cream over the past few months so MyItchyBoy’s ankles have been better of late anyway, so I am not about to say that the cotton socks are miraculous. However, I will say the new socks are lovely, they feel great, fit well and yes, when he wears these socks, he doesn’t scratch his ankles and when he wears the old socks he still does. What did we think of these socks? Overall, I would highly recommend these socks to anyone, but especially for those with eczema. We were given three pairs of Ecooutfitters socks by www.everythingforeczema.com for the purpose of testing and reviewing. MyItchyBoy will continue to wear the new cotton socks for school. What cream were you trying? We used Epaderm – ointment and cream and then moved to Diprobase ointment and cream. Hi love your site. Am on a constant look out for cotton clothes as I got two girls with eczema. Falke.com do 98% cotton socks and tights in all sort of colours in their family collection. Really good quality and lasts two children. They are cripplingly expensive though, but last. Also John Lewis and marks and spencer do cotton dresses which are slightly cheaper. Lastly I found no short sleeved light blue school shirts so I dyed some plain white cotton ones and the result was amazing. Seams and buttons don’t take the dye but my kids have to wear a tie so it covers the buttons. Works out much cheaper as well. I bought the dye from Amazon as my mum recommend a certain brand. Simply col true fabric colour, Azure 1527. I did 6 kids shirts with one packet and the result was fantastic. It’s a bit fresher looking (less grey) than the high street light blue shirts. Also works out much cheaper per shirt. Got granny to knit some scarves with navy cotton wool. Navy cotton hat from polarn o’ pyret. Navy cotton cardigans from John Lewis or m&s. Some great ideas there! Thanks! Just to say that my youngest daughter had eczema when she was a child as well as brittle asthma. The culprit was milk. When she stopped having milk and all dairy the problems went away. It took several weeks but 10 years on the difficulties have still abated. Might be worth a go. Something to do with Catein which is a protein. I wasn’t very happy about stopping all dairy products but it was amazing how well she was after even a few days. My son has been dairy free since he first tried formula milk at about 5mths old and reacted to it. He definitely has an allergy to milk, so we avoid it completely. I do know it is a common culprit for aggravating eczema though, so always a good one to ask the doctor about. So glad to hear you had success with it. My son suffered so badly from excema his face would look as if he’d been badly burned. I have discovered the main culprit is RAPESEED OIL. I discovered this by elimiating dairy from his diet but his excema got worse and I realised the margarine was the only additional change I had made. Rapeseed oil is in so many prcessed foods and is cooked with routinely but diligent avoidance has kept my son excema-free. One little mistake (eg icing containing ‘vegetable oil’) brings out his excema so his diet is carefully controlled but it is worth it. I was told by a skin specialist that dark blue and black dyes in clothing are bad triggers so we always opt for organic or eco-certified clothing. I also avoid perfumed regular brand washing powders. Good comment. We would all do well to avoid rapeseed oil, also known as canola oil. Beside the fact that it’s not good for you, most all of it is GMO. If you are a proponent of GMO food/products, I don’t mean to start a debate on that subject, my intent is only to inform those that would want to know. If natural things reduce our kid’s symptoms, then avoiding genetic mutations might be a plausible approach, right? Especially if those mutations produce herbicide resistant and pesticide effects, right?